Do conditioner can be based on advanced combination of the best sources of protein, good taste and to maintain excellent solubility? Yes of course! The best example is the product! IHS Supreme Whey is a protein supplement very rich amino acid profile, so that it comes to an enhanced protein synthesis, as well as the introduction of the body in a high anabolic state by maintaining a positive nitrogen balance. Thanks to these properties, the muscle cells are constantly in high anabolic state, allowing them to expand, improve strength and endurance at the same time in a relatively short period of time. 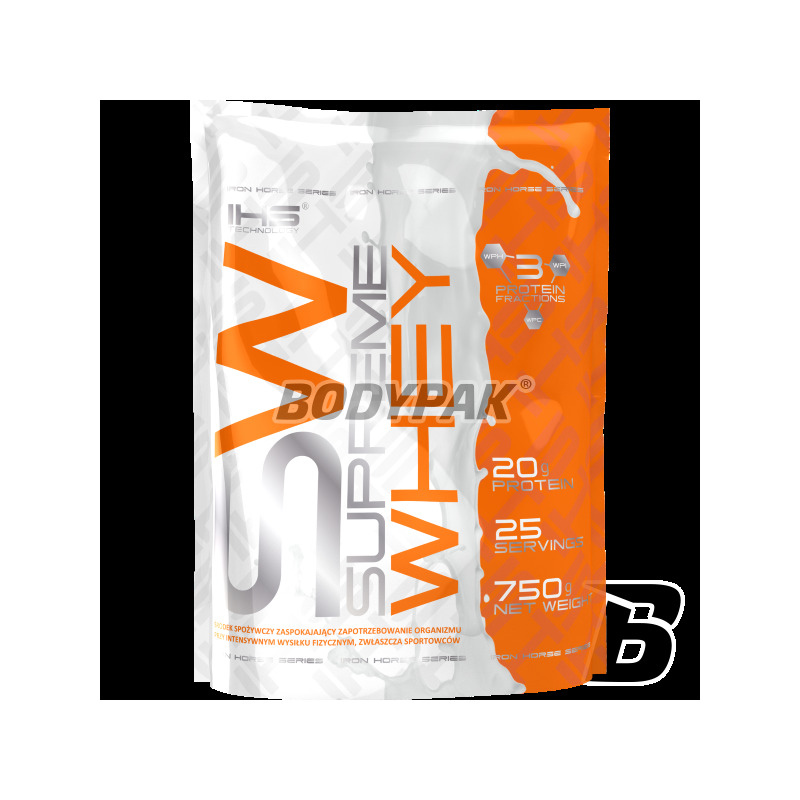 IHS Supreme Whey helps to increase muscle mass and strength, helps reduce body fat and facilitates recovery after training. This high-protein supplement is intended for all athletes and physically active people who want to supplement their diet with easily digestible protein (the highest quality). Certainly this is one of the best supplements on the market, because it contains branched chain amino acids (BCAA) make it easier to rebuild damaged muscle structures, restoring the newly anabolic processes. In addition, a set of amino acids not only supports the regeneration of the body, but is also responsible for the restoration of energy and well-being. 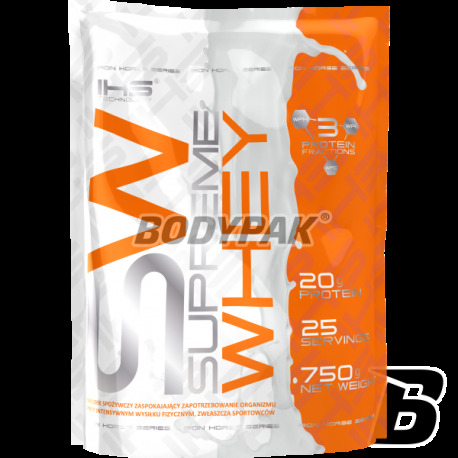 IHS Supreme Whey contains all the whey protein fractions including beta-lactoglobulin, alpha-lactalbumin, glycomacropeptides, and immunoglobulins. These are substances necessary in order to facilitate the absorption of proteins and amino acids into the blood, thereby feeding the body as quickly as possible in the micro and macronutrients. Conditioner is designed both for physically active people and those who suffer from protein deficiency. With the intense forcefield, the demand for protein increases significantly. It should also increase the protein intake during weight loss diets because protein increases metabolism, and thus can contribute to better results after the end of the period of reduction. Certainly, scientists Iron Horse have the right to be proud of their product, because they created an effective protein conditioner that can fight for the title best whey protein concentrate in the world. IHS SUPREME WHEY - DO NOT NEED ANOTHER PROTEIN! Ingredients: Dymatize concentrate, isolate and whey protein hydrolyzate thickeners (guar gum, xanthan gum), sweeteners (saccharin sodium, sucralose), aromas. Smak mleczna czekolada - Petarda! Smak ciastko- stosowałem go jakiś czas temu i był bardzo smaczny, nie pamiętam żeby cokolwiek się pieniło, grudki nie występowały, lecz dla mnie troszkę za słodki, przyswaja się bardzo dobrze, w sumie cena też atrakcyjna, polecam! Mam całkowicie odmienne zdanie. .bardzo smaczne i w miarę dobrze wycenione białko.